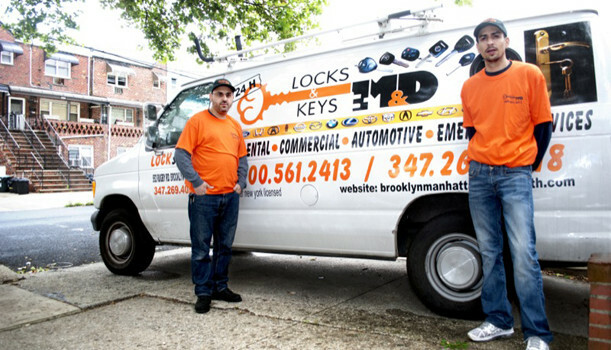 M&D Locks and Keys is New York City’s leading locksmith, not because we say so, but because you do. We have some of the highest rated customer reviews in the business. That’s why the NYPD, New York City Sheriff, Ted Baker Manhattan, Armani, Geico Insurance, the New York State Employees Retirement System, US Marines and thousands of New Yorkers use our services. We provide New York City residents and business owners with complete mobile locksmith services including Residential, commercial and automotive lock and key solutions. We also install security cameras, intercom systems and access control units. Our ability to get to you quickly is the result of years of experience driving through the streets of New York. Our dispatchers and advanced GPS systems guide our vans through the toughest NYC traffic, through side streets and little known routes that only come from years of experience as New York locksmiths. Most people would be considered crazy to drive through New York during rush hour, but our technicians relish the opportunity to “wow” clients. But getting to you is not even the best of what M&D Locks and Keys has to offer. We get to you fast, sure, but our goal is to get you back on your way fast, too. Such service only comes from experience and professionalism as well as the most advanced lockout equipment in the business. Each van is a self-contained unit so we do all our work right on the spot. That’s how we’ve become the fastest, most trusted and reliable locksmith in the 5 boroughs. Broke your key in the ignition or door? No problem, we’re experts at key extraction. We have mobile locksmith units throughout New York City so chances are, there’s an M$D locksmith technician near you right now. We’re trusted and used by the NYPD, New York City Sheriff, US Marines and many others throughout the tri-state area. Our locksmiths are trained, certified and insured for your protection.